If you saw the "Our Story" video, you'll know Vitev was built upon the successes of our first natural alkaline product...alkaStream. We didn't want to delete history, which is why you'll see alkaStream mentioned by some of the earlier adopters below. Vitev water has the same beneficial qualities, we've just improved the delivery systems. 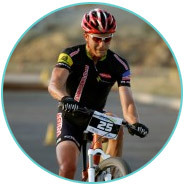 Evan Plews is a professional mountain biker and reigning 2011 US National Champion. He contacted us because he was searching for a way to rebuild after a few injuries and sickness and because he was having a hard time recovering from his races. He added natural alkaline water to his regimen and is off to his best start ever this 2012 season. He loved our simple approach and natural process. We love that he's winning and getting the next level in his performance." 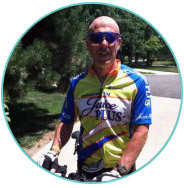 Mickey is an ultra endurance athlete who was having problems with cramping, recovery and hydration. He was gracious enough to provide a lengthy interview on what he's noticed after dropping Gatorade for natural alkaline water. When your body is as finely tuned as his, you notice a lot. "I love the product. I had already been drinking high alkaline water from a friend's Enagic machine so the benefits were already realized. However the taste of this water is much better and the best way to describe it is that it is "very wet!" Since drinking this water I have shed 15 pounds in all the right places. I have more energy, people say I look 5 years younger and I agree." "I consider myself pretty knowledgeable about fitness and healthy eating, but the idea that the right water could actually improve your exercise performance, hydration and nutrition? I was clueless. And albeit a bit skeptical. Anything that promises to do so much just seems fishy. The first time I tried it, I did a blind taste-test to see if I could tell the difference between my regular tap water and the alkaStream water. Immediately, I knew the alkaStream from what came from the tap—it was just so tasteless and, for lack of a better word, just so much more water-y. My husband noticed the difference, too, as did my dog who, after having the choice between drinking her usual tap water or the alkaStream water, chose the alkaStream water dish every darn time. Besides the improved taste, the water also started to improve my workout performance. It wasn't like I was on the juice or anything, but I could just breathe better, and it seemed like my muscles were getting more oxygen. The system was pretty easy to install, too. And the price tag is far less than other similar type alkaline-water systems. In a nutshell, I'm not sure how I drank water before it! I used to think water was just water…not anymore." "Nothing is more important to Moms than safe and healthy kids. We use the Vitev ULTRA because we wanted to be sure our water was clean no matter what and we liked the idea of adding the healthy minerals back in. It seemed like the perfect balance. What we didn’t realize was how much better the water would make us feel. The kids love it and no longer want the sugary stuff and I’ve noticed a big energy boost as well. Everything just seems to be better with the water. Especially the coffee…which is the perfect pairing for a 'chocoholic'." "Myself and my wife Abby have had other ionizing machines before and literally paid thousands of dollars to get the "best water possible" for our bodies. Before the AlkaStream we paid hundreds out for filters every couple of months but with the AlkaStream it is so simple and the crazy part is we get the same quality of water as we did with the $3000 machine! I highly recommend this product to anyone looking for a great water purification and alkalizing system for their house. It has worked great for my family and is very easy to install and we even are able to put it under the counter for use next to the faucet!" "I have a great alkaline diet. I worked on it for a year but still couldn't keep a steady pH. Adding your natural alkaline water to my regimen has really put me into the no fluctuation zone. I am steady and lovin it! Thanks for such a great product!" "After we purchased our Enagic system, which we could only afford with financing, we began having buyer's remorse. So we started doing more more research. We eventually found the waterfyi.com website which then led us to you. Because we had a trial period, we decided to test the alkaStream out as well. We sent the Enagic system back and saved over $4000! Thank you so much!" Trevor has great things to say for acne sufferers: as soon as he started drinking the water, his face began to clear. Further help came when he started washing his face with the water. He says that drinking and washing in Sunnyvale's water recreates all of the original problems (go figure, right?). Though I don't wash with it at the moment, drinking it has done wonders for me concerning detoxification. It makes me feel a bit calmer emotionally, too, somehow (maybe this has to do with toxins elimination(?)). And of course, our dear pets (3 cats, 2 birds): finally, they are all drinking it almost exclusively to tap water AND we are experiencing softer, shinier fur for kitties and our 2 birds show many less signs of dry skin, which is common and difficult to manage in domestic birds. We are ALL healthier and more comfortable. "After 3 glasses of alkaStream water, my ulcer and pain went away. The medication wasn't helping, but the water sure did"
"After 2 weeks of drinking the water, I lost 6 pounds"
"My wife and I loved the Alkastream water. Clean, light and refreshing are words we have used to describe this water to our family and friends. Everyone who has tried it has liked it. I immediately noticed that the water seemed to be more hydrating. I run 30-50 miles a week and a lot of those miles are in 90 degree weather. I was amazed that after drinking 64-100 ounces of this water for a couple of days, I wasn't getting the normal thirsty, dry mouth feeling. I love how the water goes down so easy and doesn't fill me up and seems to be absorbed in my body so quickly. I think I am experiencing TRUE hydration." "I used to suffer from frequent and severe hemorrhoid flare ups. Since drinking the alkaStream water and adding Core Health Digestive enzymes, I haven't had a problem." - Marvin S, Cleveland, OH. "We installed the alkaStream with our Reverse osmosis system because we've learned we need minerals in our water. Before the alkaStream we were paying way too much on bottled alkaline water and it wasn't as easy to drink as the alkaStream. Now we have clean and healthy water"
"I've struggled with acid reflux and digestive issues for many years. Nothing has helped me as much as the water and I've been able to stop taking medications." "Last summer I moved with my family from Madrid (Spain) to Mountain View. The initial idea was to stay here one year, therefore we didn't bring with us our household items and we decided to buy everything here. A few months later I noticed that my white dishes started to have brown spots and I thought the dishwasher did not clean well. But I realized very soon that it was a water quality problem. I decided to investigate and buy a water filter to clean the waste and toxins. I decided to buy the alkaStream, not only because it eliminates almost all the toxins but also because it remineralized the water. I remember when I bought the filter I was told about the maintenance and operation and that I have to clean the filter approx. once a month. But suddenly, less than a month I already noticed that not much water came out of the faucet and I remembered that I had to clean the filter. I removed the device and you can't imagine how the filter looked like. Unbelievable, there was so much dirt that the filter wasn't anymore white, but brown chocolate. I panicked and my husband had to help clean the filter with the sponge because I wasn't able to remove the dirt. It's creepy to be aware nowadays of how much dirt we have been drinking & eating the whole family for so long. It doesn't make sense if you buy organic food and then you wash and cook it with contaminated water. To us, this filter has changed our lives. We are healthier and feel much better. I didn't want to miss the opportunity to put my testimony in the alkaStream page, because people usually forget to remember to congratulate a good team or a good product, usually we are always much more willing to write letters or notes of claims. In my business I've heard that a quiet customer is a happy customer, but I don't want to be a quiet customer, I want you to know that I am a happy customer. Thank you very much for this wonderful product!" "I've been drinking from my new alkastream filter for about 3 weeks now and I am here to report what I have noticed so far. I am a 40 yr old female – no major health issues. I am drinking a minimum of 32 oz per day but on most days I am up to roughly 60 ounces and many times more than 64 ounces. Previously I had a bowel movement every 3-4 days – now, much to my surprise I am going just about every day. I hesitate to get so personal and be graphic but seriously – my entire life I have been constapated. About three of those days I went 2x – never in my life did I go to the bathroom 2 times. It's like as if I increased my fiber or something. Ok – enough about this "crap". My cystic acne is clearing up a little over the past few days, but to be fair, I need to wait for my next cycle and see if it comes back. I've battled this obstacle for over ten years. And I am finally waking up without the alarm clock and not exhausted – I am pretty sure it is because of alkastream although I also get B12 shots. Bottom line – I would buy the unit all over again in a heartbeat. It wasn't cheap (for me anyway) but a wonderful investment for my health and I have been using it everyday. If you are looking to make a big change in your health in my opinion this is a great way to get started. An alkaline diet is difficult to achieve but a little each day can make a big dent over time. Good luck to you all."